Home / Modern Pest Blog / Powderpost Beetles: What are they and why should I care? Powderpost Beetles: What are they and why should I care? The name “powderpost” doesn’t sound so intimidating, but what if you heard “wood-boring” or “termite“? The reaction would be much different, and that is the response that the powderpost beetle should receive as well. 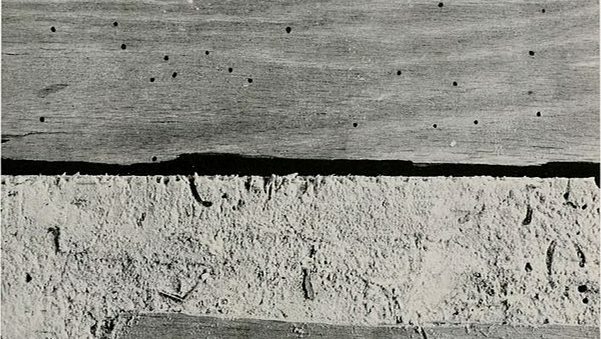 Powderpost beetles are the second most destructive insect for wood in buildings and furniture – second only behind termites. Well, technically, it’s not one insect, but a group of several different wood-boring insects that range from 1/8” to 3/4” long. They get their name due to the fine, flour like residue they leave behind while destroying your wood structures and objects. There is a lot of confusion about identifying whether damage is from a powderpost beetle and if that damage is recent or old. Once that is determined, a homeowner must then decide on treatment options, all with the possibility of never seeing a bug. If you suspect the damage is from powderpost beetles, there are a few telltale signs of their destruction. They will leave behind small, round, holes where the adult insects have chewed its way and emerged out of the wood. These newly emerged adults will mate and leave behind eggs on the surface or just below the surface of your unfinished wood. These eggs hatch into larvae; which bore into the wood; will chew around for months or up to 12 years and emerge later as adults out of the wood. These adults are nocturnal and are usually never seen by the owner. The key to preventing lots of damage is early detection. However, since they live subsurface in the wood, detection cannot happen until the adults emerge. Therefore, detecting the holes left behind in the wood by powderpost beetles is critical. The holes will be small, about the size of a pencil lead. And if the wood is rattled or shaken, a fine powder will come out. They can often be brought in with wood pieces of furniture, lumber or finished wood products like paneling or wood floors. With the popularity of reclaimed barn wood, infestations can be serious. The adults will not lay their eggs on finished, varnished, stained, painted, waxed, or any other finished wood – only unfinished wood. They could already be in a piece of furniture that you finish. They could emerge and lay eggs in the holes they just came out of. So seal any holes in finished furniture too. First off, reduce the moisture in the environment. This may mean more ventilation in an attic, basement or shed. Second, inspect wood brought into your home for construction. Ensure it’s been kiln dried or chemically treated. Be extra careful in bringing in that yard furniture to your basement if it is wood and not finished. 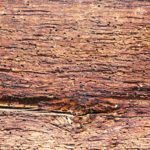 If left untouched, a powderpost beetle infestation could cause a lot of wood damage and eventually affect the integrity of the wood they are boring into. If this is a floor joist or sill plate, the damage can quickly multiply into other compounding damage. Why you don’t need to worry. Treatment may take some time, thus a wait and see attitude might be best – especially in detection. Spring is often the time that adults emerge, and when treatment is most effective. So if you see evidence, give Modern Pest Services a call. A trained Pest Professional can properly assess and detect live activity and then help you with your options for treatment. Call or click today to get a FREE quote and schedule a service!